NEWARK, NJ — Walk into the New Jersey Devils dressing room at Prudential Center, look up and there it is in big, block letters. Though not unique that a team has motivational and inspirational words or phrases in its work place be seen on a daily basis, Devils players and coaches take the word “brotherhood” to heart, believing its meaning is at the core of the club’s success. “I said last year that we want to make this place a brotherhood not a neighborhood,” Devils center Brian Boyle explained to Sporting News. “We don’t want everyone to just be cordial to one another, we want the relationship to go deeper than that amongst your teammates — amongst everybody in the organization really. After missing the playoffs five years in a row, the Devils had 97 points last season, securing the second wild card in the Eastern Conference. There were many reasons for the Devils success — not the least of which was a Hart Trophy season from Taylor Hall — but ask the coach and the players why they were a playoff team and everyone circles back to the brotherhood, forged on buying in to a set of ideals both on and off the ice, that galvanized the group. The dye was cast by Hynes during exit interviews with the players following a 70-point campaign in 2016-17, a message delivered to all, but especially key veterans. 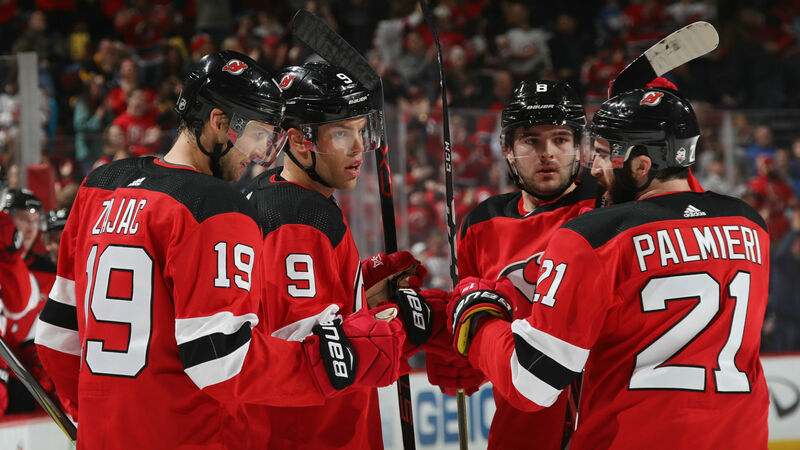 Those players, notably Hall, took Hynes’ message to heart and there was a different vibe around the Devils last season. Perhaps helping the team come together more as a family was the way the entire organization rallied around Boyle when he was diagnosed with a treatable form of leukemia during training camp. “The guys showed me that love throughout the year, the support, help me and my family needed,” said Boyle. “You know you are in the right place when something awful happens to you, but you have unbelievable support like I did. Perhaps with a nod towards the strong bond within the Devils room, general manager Ray Shero did not make many offseason changes to the personnel from last year’s roster. Defenseman John Moore and grinding forward Brian Gibbons left as free agents. Late season additions Patrick Maroon and Michael Grabner did likewise. Rugged d-man Eric Gryba, waiver-wire pickup Jean-Sebastien Dea and former first-round pick John Quenneville are the only new faces on the roster this year. “I think it means management believes in us, what we are building here,” Boyle told Sporting News. A trip to Switzerland and Sweden as part of the NHL Global Series to close out training camp this year and start the 2018-19 regular season helped renew the bond of brotherhood the Devils feel. A 5-2 season-opening victory over Connor McDavid and the Edmonton Oilers in Gothenburg, Sweden last Saturday put an exclamation point on the trip before the club returned to North America for Thursday’s home opener against the Washington Capitals. The building blocks for success are in place.